It seems that it was only a matter of time before someone caught on that something was awry in Fontana. 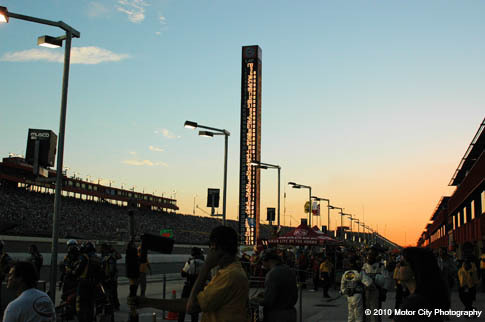 Regardless of the media spin that blamed the economy, the boring racing and the rotten weather for the poor attendance, Auto Club Speedway now finds itself clearly in NASCAR�s crosshairs and it doesn�t seem to have a clue what to do. No one in the front office really wanted to consider messing with the status quo but it�s time to get real before things get any worse. Rumor has it that the Fontana February race date will be given to another track, presumably Kansas Speedway, by as early as next year. It�s been a long time coming and at this point appeals from ACS will not be met with much enthusiasm from the powers that be. No one can quite put a finger on how things got to this point but one thing is clear, two NASCAR races in Southern California is one too many. 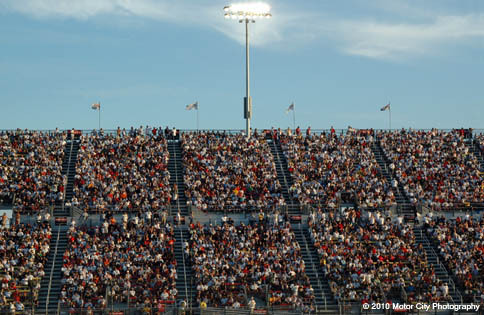 I began covering the Fontana races in 2004 and the stands for both races were packed year in and year out until 2007. You could cut the excitement then with a knife. During that time, the community got behind the events by staging downtown parties that rivaled the one offered in downtown Charlotte. The City of Ontario did the same and it was clear to all that NASCAR coming to town was a big deal. Somehow somewhere things changed and these events went by the wayside. In some ways it seemed ACS began to focus upon a demographic that had nothing to do with the core group that supported these races in the past. Subsequent track improvements included a fan zone that featured a Wolfgang Puck restaurant, park landscaping and a stage providing those with a need to party a place to go but something was missing. It isn�t clear what Puck has to do with NASCAR or any other form of racing but someone at ACS must have thought the track was going to be primarily serving the IndyCar crowd. An In/Out Burger stand would have been more widely accepted than standard West Hollywood wine and cheese cuisine. Within a year the place took on a corporate feel that lacked the verve and the roughness that Fontana has always been secretly proud of and the people that were once willing to put their hard earned cash up for grabs to prove it found other ways to spend their Sundays. I don�t want to completely disregard the fact that discretionary cash for most NASCAR devotees is less available and that overall the TV ratings and attendance has suffered at other tracks as well. I also don�t want to leave the impression that one restaurant is the cause for poor attendance. It�s a combination of factors that Track President Gillian Zucker and her staff haven�t been able to figure out yet. Maybe someday they�ll find the key that opens the door but until that happens, the first race of the season will likely remain a thing of the past.